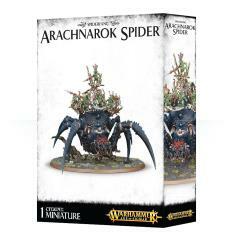 This multi-part plastic kit contains 86 components with which to make your Arachnarok Spider truly unique, including a flinger and a catchweb spidershrine. There are also eight Spiderfang Grot crew for the howdah, many tiny spiders to adorn the base and a Spiderfang Shaman. The Arachnarok Spider stands atop a Citadel 160mm Round base.